Before becoming a household name, Mr. T grew up in the Chicago projects, served in the US Army Military Police Corps, worked as a bouncer, a bodyguard, and boxer. He emerged in the neon age of colorful personalities and self-stylized eccentrics who defined the trends and fads of the era, making a career out of being himself, or a slightly fictionalized version of himself. Just try to picture anyone else as Clubber Lang or B.A. Baracus (this is me denying the existence of the 2010 A-Team reboot). He’s, a genuine article tough guy with an unparalleled fashion sense. 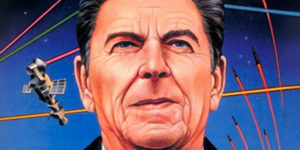 Yet despite his tough guy persona, he stood as a positive role model to kids across America, promoting respect, self-esteem, and acting as an advocate of the “Just Say No” anti-drug campaign of the 1980s. He’s outlasted many of his contemporaries—I’m looking at you Boy George—and seems to understand his effect on the zeitgeist; sometimes playing against his tough image for laughs. His appearances on Late Night with Conan O’Brian or in roles like The Bearded Lady in Freaked indicate his good-natured ability to lampoon and celebrate himself. Clearly, I’m a fan of the man’s work. This is part of the reason that I chose a Mr. T action figure as a good luck charm to help me through travel anxieties last year. My fandom also explains why I jumped at the chance to snap a picture with Mr. T cosplayer Macdaniel Macleod at ComicCONN a few years ago. Normally I’m somewhat introverted and don’t typically initiate interactions with strangers, never mind stopping to pose for a photo with one. Dress that stranger as Mr. T and all bets are off. To be fair, Macdaniel’s take on Mr. T is spot-on nearly as earnest as the real deal. 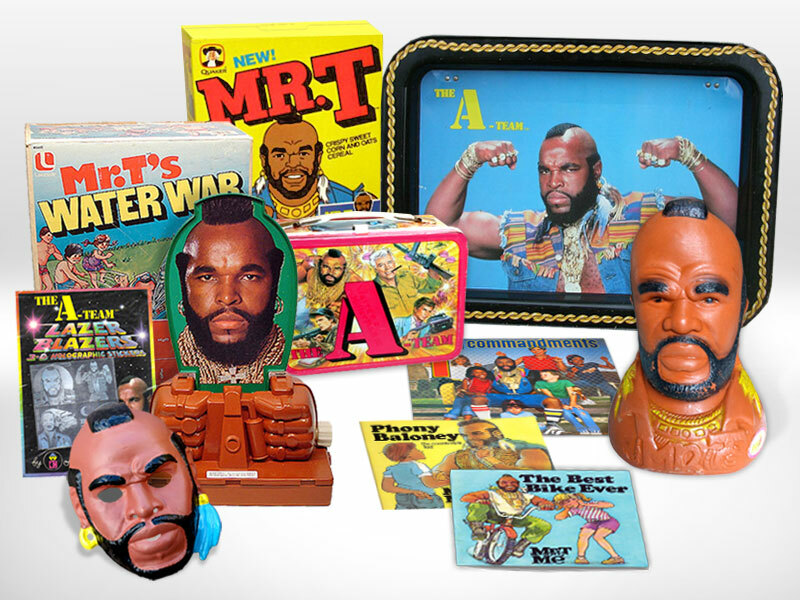 Whether licensed under his own name, The A-Team, or the Ruby Spears Mister T cartoon, Mr. T’s likeness was used to sell breakfast cereal, Shrinky Dinks, Presto Magix, Lazer Blazers holographic stickers, Lite-Brite sets, coin banks, coloring books, lunch boxes and much more throughout the 80s. As a kid looking to dole out his own fool pitying, I was mostly interested in the action figures. I’ve recently become reunited with a vintage 6” B.A. 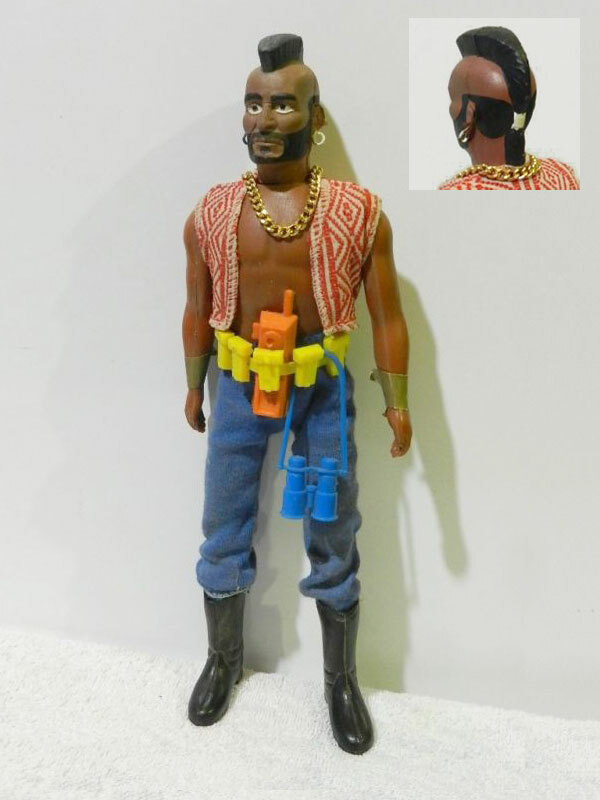 Baracus figure that I had as a child, as well as a 3.75” B.A. Baracus, and a 12” Mr. T doll that I missed out on growing up. Mr. T’s household name status was galvanized by such toys, all of which were licensed by Galoob in 1983. While the 3.75” and 6” figures were branded under The A-Team, the 6” figure is the only member of The A-Team to list the actor’s name on the card. The 12” Mr. T, as well the talking variation with a price tag consistently out of my reach, was branded as Mr. T Real-Life Superhero. Another long-lost Mr. T that I was able to recover is the 6” Clubber Lang action figure licensed by Phoenix Toys from their line of Rocky action figures. It wasn’t easy finding a Clubber Lang in a condition I was happy with. The figures being sold are usually missing the boxing gloves or championship belt accessories, but more often, they were missing the removable boxing trunks. This makes me wonder what kids were up to with their Clubber Lang figures. If this was some sort of amateur attempt of fool pitying, they were certainly doing it wrong. In my searches for Mr. T ephemera, I continually stumble across unlicensed curiosities and oddities that range from sad to terrifying. The collectible toy market is rife with shoddy bootleg facsimiles created to cash in on a particular craze. These searches also yield lots of rarities from foreign licensees as well as generally odd merchandising choices. 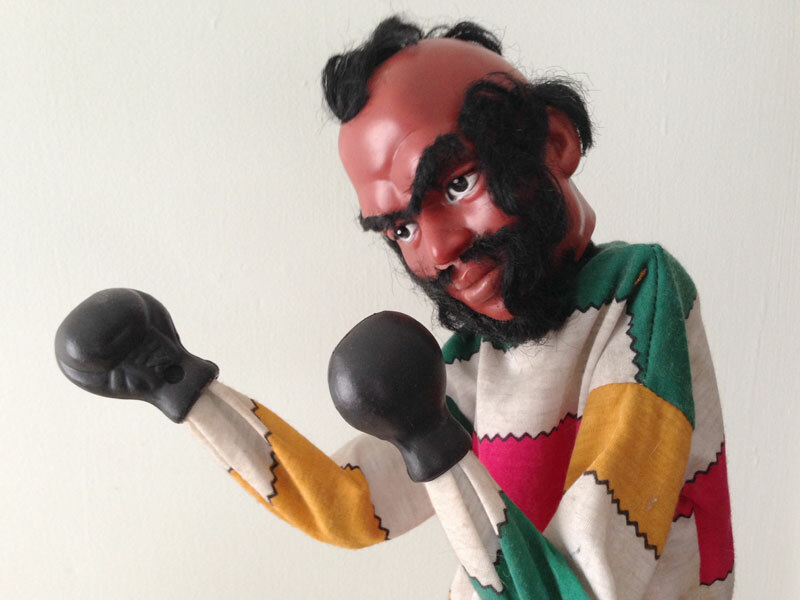 One such item that has been with me since childhood is a Mr. T punching puppet. Made to capitalize on Mr. T’s appearance in Rocky III, this strange item features a hard plastic head that bobbles atop a spring and a beard and mohawk made of uncomfortably curly doll hair. The puppeteer activates the punching action by working two levers in the puppet’s torso, which in this case appears to be clad in a Rastafarian muumuu. I’ve always loved this bozo of a puppet with his disheveled bedhead and jerky punches. Sometimes I find specimens like these more interesting than the officially sanctioned products. This blow-molded weirdo from Peru has popped in a couple of my searches for Mr. T toys and was last seen with a $125 price tag on eBay. 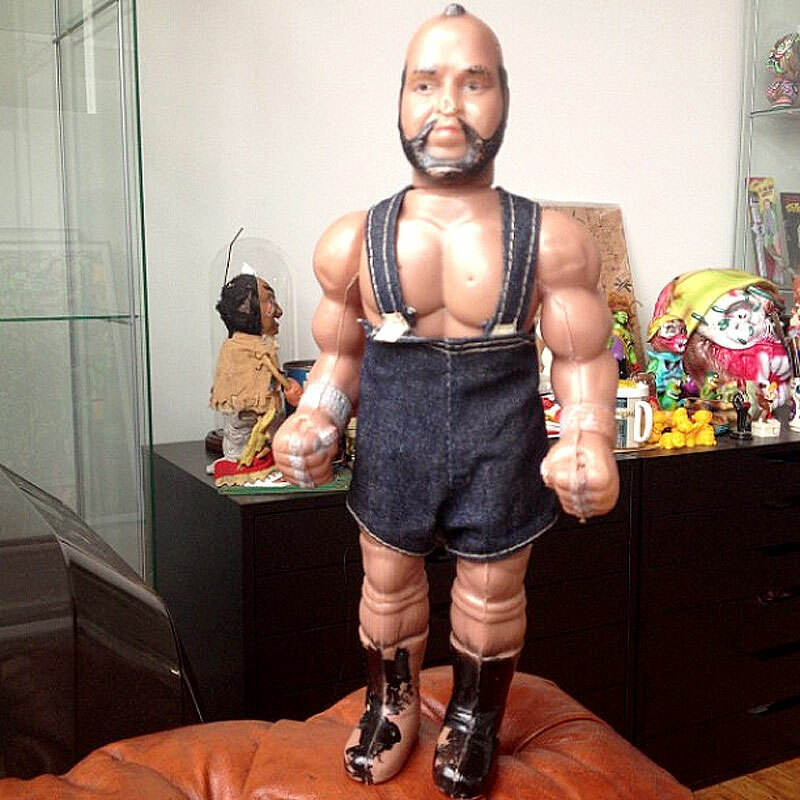 I’d gladly display him in my Mr. T collection, but can’t really justify spending $125 on a Mr. T toy that looks more like Dom DeLuise in lederhosen. It’s hard to tell if this Argentinian figure from a company called Galgo is a bootleg or not. 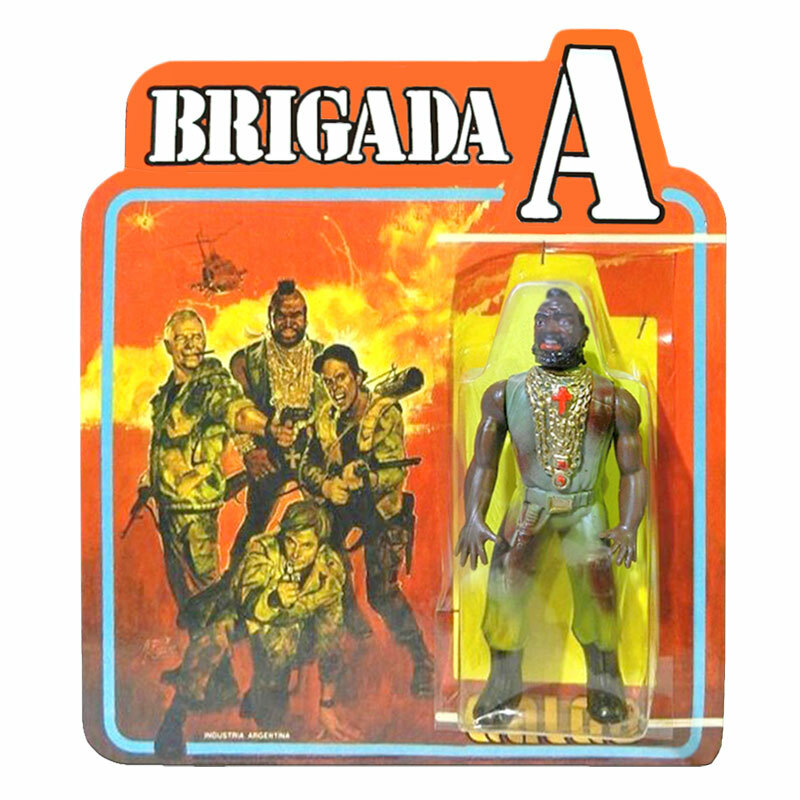 It seems that Galgo was responsible for a full line of Brigada A (The A-Team) toys, and the packaging art looks good enough to be official. Other than the tiny hands with splayed out fingers that look like an attempt to communicate its age in an “I’m this many” fashion, the figure sculpt isn’t that bad. The paint, however, looks like it’s been applied with a paintball gun. Apparently Brigada A was just as popular in Argentina as it was here in the US. Here’s another Argentinian figure that I keep running across. Clearly a bootleg, this creature’s head seems to have been cast from the 6” Galoob action figure and cobbled onto a freakishly misshapen body that looks like an LJN WWF Wrestler figure as made by P.T. Barnum. Worst of all, this Mr. T appears to be standing on what looks like backward bending goat legs. This guy is such a mess that I can’t help feeling bad for all the Argentine children who had to settle for this slapdash homunculus of an action figure. We Americans are spoiled. This last knockoff falls squarely into the so-bad-it’s-good category and is my favorite so far. While the mohawk and gold jewelry are in place, this attempt, once again from Argentina, gets Mr.T so wrong. The tall mohawk ties up in a ponytail in the back, and the figure is far too skinny to toss any baddies through the air. These details, as well as the gaucho styled clothing, are what make this figure particularly charming to me. I’ve found different versions of him online both loose and packaged as La Hombres de Accion, with a price tag as high as $160. Luckily I was able to find him for a fraction of the price and will be adding it to my Mr. T collection. I just hope the other Mr. Ts don’t pick on him. 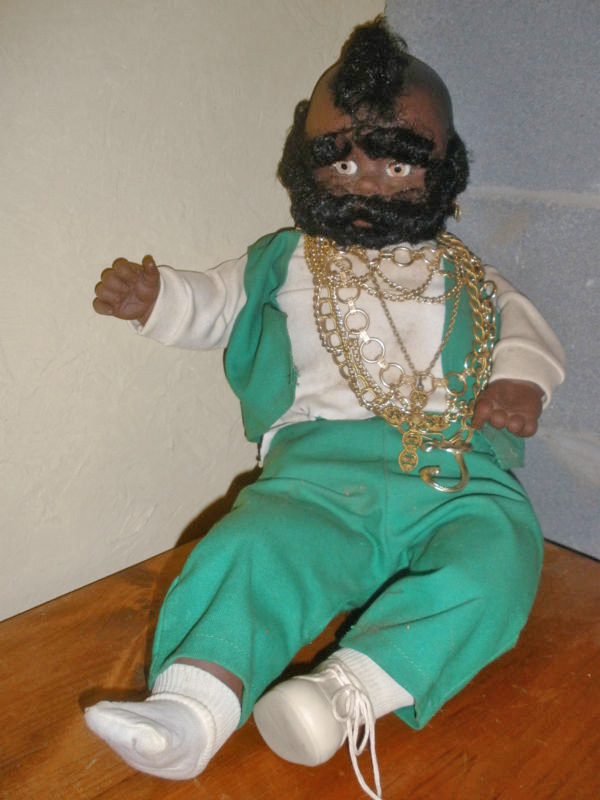 Searches for vintage Mr. T toys on eBay or Etsy sometimes yield a variety of weird Mr. T – Cabbage Patch Kid hybrids dolls. Clearly these freakish homemade creations were the product of craft store patterns sold as an attempt to cash in on two hot trends in the 80s. I seem to remember other such attempts at Cabbage Patch Kid mimicry, specifically horrible pucker-faced dolls made by stuffing pantyhose with pillow stuffing. I can’t imagine that the homely Cabbage Patch Mr. Ts were well received. I picture a Christmas day in the early 80s: embarrassed boys wondering why they were given a weird homemade doll, and horrified girls wondering why their baby had a beard and a mohawk. I’d always assumed that the Mr. T doll patterns were a knockoff product but have discovered that they were actually an officially item made by Miss Martha Originals and authorized by Mr. T. Still, it doesn’t make them less weird. In 2005, artist, collector, and Mr. T enthusiast, Greg Rivera displayed his huge collection of homemade Mr. T dolls at a gallery show called I Pity the Doll. Warning! This next find is the type of thing that can’t be unseen. If you are the type of person that is easily spooked, turn back now. You have been warned. This last creep has been haunting eBay for a while now and looks to me like an item that belongs in the museum of cursed artifacts of paranormal investigators Ed and Lorraine Warren. 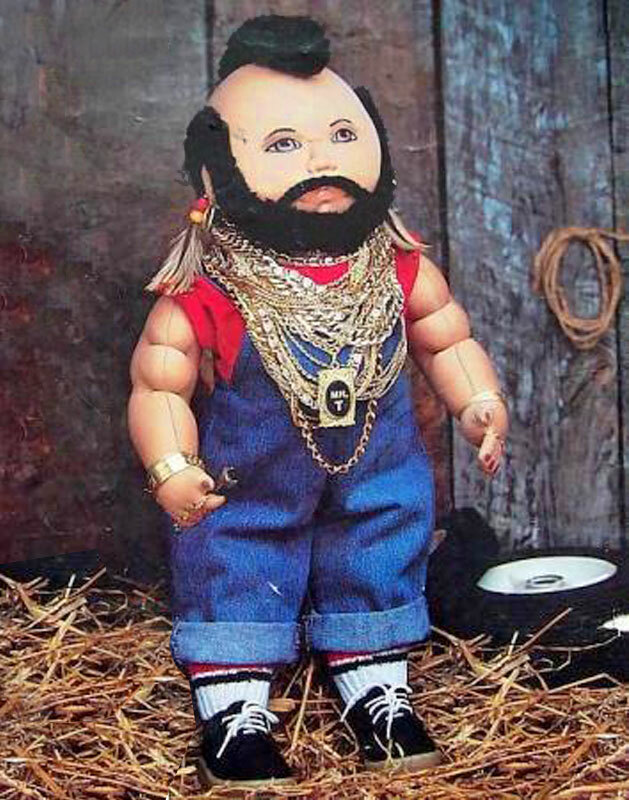 Originally, a baby doll—the kind with the already creepy blinking eyes—it’s been altered with rooted doll hair and gold chains to into a terrible man-baby that resembles Mr. T only in hair patterns. The eBay seller is asking $80 for this abomination, describing it as unique (which it is) and hilarious (which it is not). Personally, I wouldn’t take it if they offered me $80 to take it of their hands. Misfit toys like these can sometimes be overlooked because of their crude execution, or dismissed as unauthorized junk. I can’t help being charmed by such flaws. 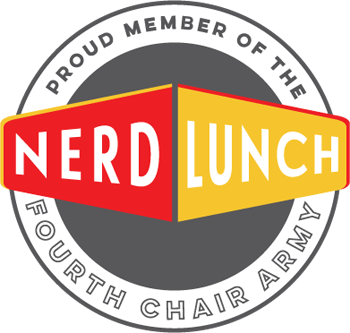 I find them significant in that they symbolize the ubiquity of American pop culture. Some of the details may get lost in translation but the general idea is there. The value is in the interpretation. That last paragraph does not apply to that horrifying altered baby doll. That thing is evil and needs to be taken out. I suggest we call Mr. T (cue The A-Team theme). Oh man, this is the best thing I’ve seen in a long, long time. Personally, I try not collect items that were based on an actual person (you gotta limit yourself somehow! ), but man, Mr. T items make it so hard! If I came across the talking Mr. T, I think my resolve would shatter. 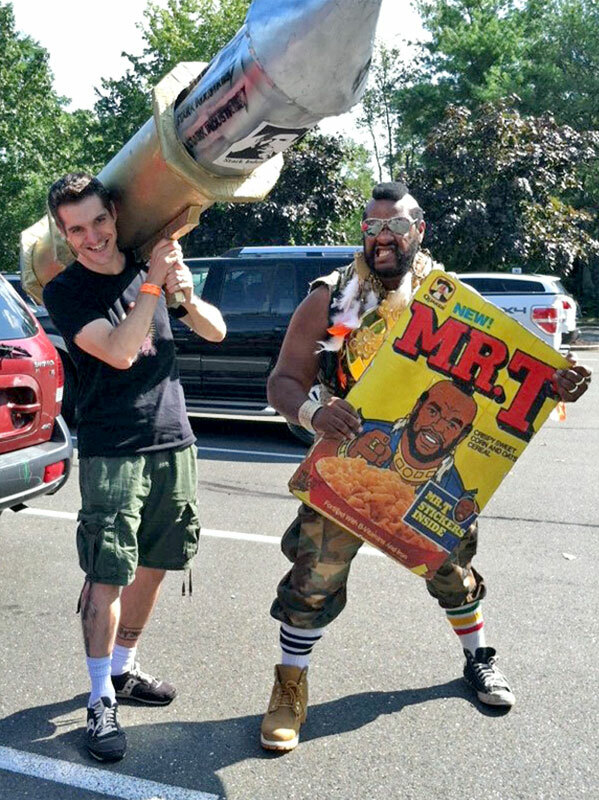 Do you collect A-Team items too, or just Mr. T? Limit yourself? I can stop anytime I want. But seriously, person specific collecting can get out of hand. I’m pretty selective about adding to the collection. I primarily go for the Mr. t specific stuff, but have no need to collect it all. For instance, I have no need for a Mr. T chia Pet. There is a loose talking Mr. T up on eBay right now. 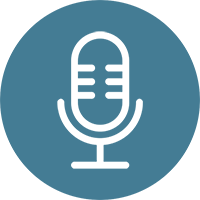 The seller states that his voice is a little squeaky from age. I’m tempted by the idea of helium pitched jibba jabba. Wow, thanks for the double read! Talking K.I.T.T. is pretty cool. I never had that one as a kid. It’s funny that you liken Mr. T to He-Man because I’ve been concocting a custom action figure concept that merges the two. I love Mr. T so much! As a matter of fact, I have an A-Team kite over my TV and several Mr. T action figures. I had what I called a “Lettuce Patch” kid my grandma made me that was disappointing, but if she had made me a Mr. T? 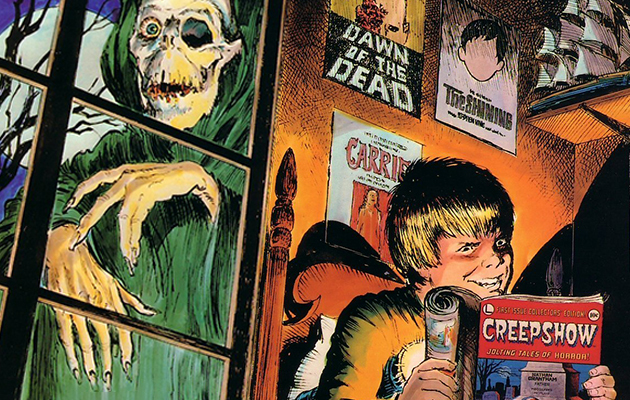 I’d have been the happiest kid on the block. Thanks for putting this together–it reminds me that I need to see if my local junk store still has that Mr. T punching puppet. Lettuce Patch Kid! Pretty good. At least she tried. That reminds me of a very sad homemade plush Smurf I was given when I was little, It was sort of flat and looked like he’d been hit by a car. As for the punching puppet…what are you waiting for? Rescue that sucka from the junk store. It’s in Mantua, NJ, currently, yes. I’m planning on moving somewhere else in South Jersey in the next couple of months. Are you local? 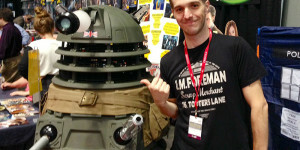 I figured the fact that you attended ComiCONN that you were North of me. And MacDaniel is THE MAN and drove from Massachusetts to my art show in Philly in December. The crowd went nuts. 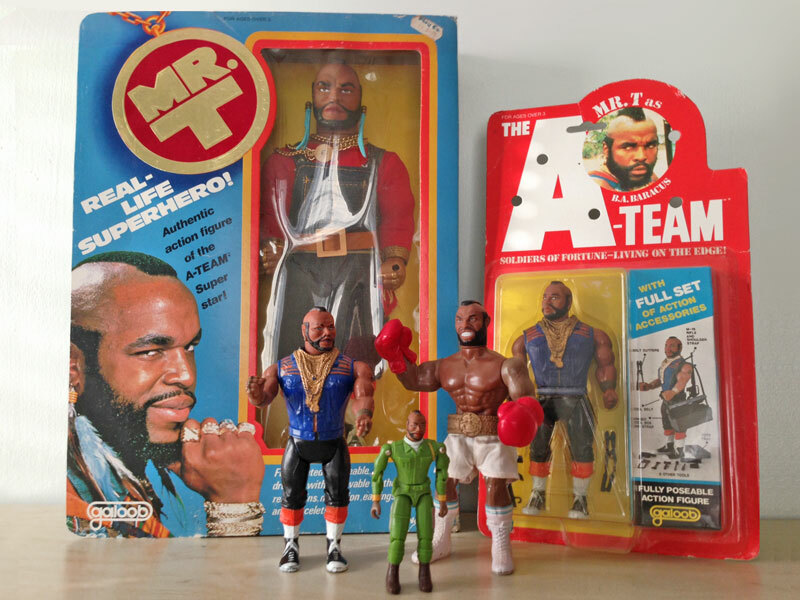 I’m sure you’ve encountered that there is simply no shortage of Mr. T memorabilia to collect. It’s insane. Most of what’s out there is really interesting too, and much of it is affordable. Sadly, I think about 95% or more of my collection came from eBay. I rarely if ever stumble upon anything I want or need at a shop, show, or flea market. I’m just outside of New Haven, CT. Indeed, Mr. T collectibles are endless. Most of my finds are eBay too. I’m still on the lookout for the coin bank bust, and I think ill be done. 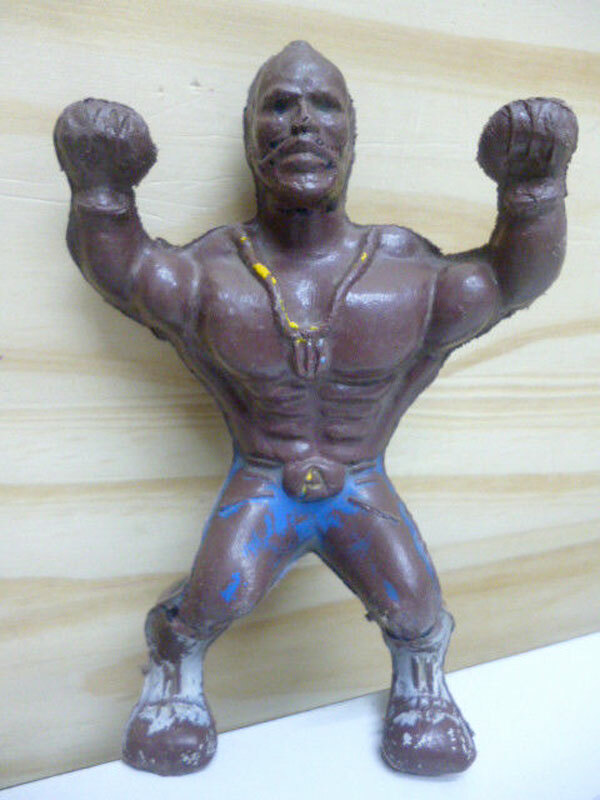 Though I just found this Galoob wrestling Mr. T that I wasn’t even aware of. http://www.ebay.com/itm/281289482222 It’s a repaint of the 6″ A-Team figure, but it’s really cool nonetheless. With that sort of price tag I’ll never add it to my collection.